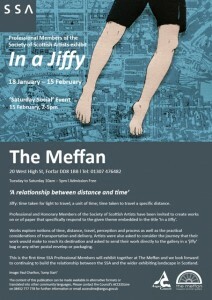 Jiffy: time taken for light to travel; a unit of time; time taken to travel a specific distance. 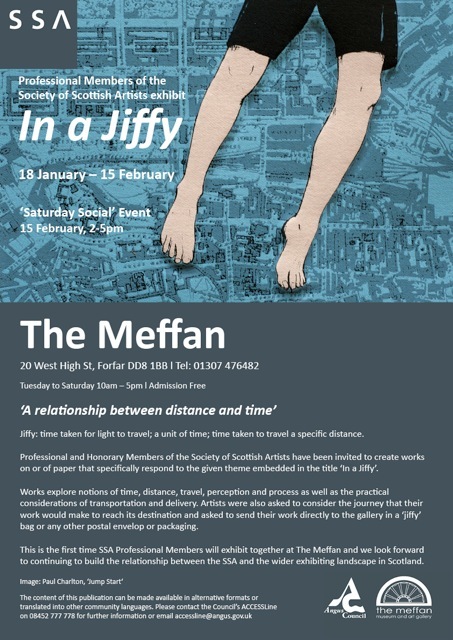 Professional and Honorary Members of the Society of Scottish Artists have been invited to create works on or of paper that specifically respond to the given theme embedded in the title ‘In a Jiffy’. Works explore notions of time, distance, travel, perception and process as well as the practical considerations of transportation and delivery. Artists were also asked to consider the journey that their work would make to reach its destination and asked to send their work directly to the gallery in a ‘jiffy’ bag or any other postal envelop or packaging. The Meffan is situated in Forfar town centre, close to the Cross and Town and County Hall. Parking available at nearby Myre car park. Full disabled access with lift to upper galleries.